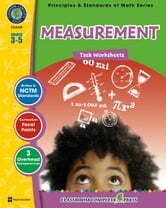 Get measuring with lengths and weights. Our resource provides task and word problems surrounding real-life scenarios. Compare different long jump results. Try it yourself and measure the results in feet and inches (meters). Measure the length of objects using your hand as a unit of measure. Double a cookie recipe. Double check a company's measurement calculations by finding out how many teaspoons are in a tablespoon, and how many tablespoons are in a cup. Convert weights from pounds to ounces and kilograms. Find the temperature on Mars based on what the rover recorded. Find the volume of differently sized boxes. Get acquainted with angles by using a protractor. The task sheets provide a leveled approach to learning, starting with grade 3 and increasing in difficulty to grade 5. Aligned to your State Standards and meeting the concepts addressed by the NCTM standards, reproducible task sheets, drill sheets, review and answer key are included.